If you have a digital camera that supports PictBridge printing, you can connect it to the product and print your photos directly from the camera. Check your camera manual to see if it is compatible. Note: Your photos must be in JPG format and sized from 80 × 80 to 9200 × 9200 pixels. Epson cannot guarantee the compatibility of your camera. Some combinations of paper type, size, and layout may not be supported, depending on your camera and the product settings. Load the paper you want to use for printing. Connect the USB cable that came with your camera to the USB port on the front of your product. Note: You cannot use the USB port to transfer images from your camera to your computer. Follow the instructions that came with your camera to select your photos and settings, and print. 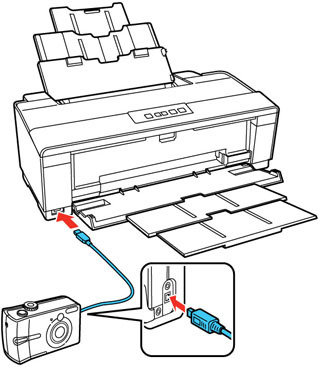 When you finish printing, turn off your camera and disconnect it from the product.